It’s the last New Comic Book Day of August and, coincidentally, it’s also the 96th birthday of the late Jack Kirby. So be sure to remember all the amazing work Kirby did as you read comics this week and enjoy Comics for Noobs, which happens to feature no less than two Kirby creations. With the Godbomb arc recently wrapped, the past, present, and future versions of Thor can all breathe a little easier. Even so, they missed much on their millenia-spanning journey. While past Thor gets reacquainted with the pleasures of Midgard, present Thor travels the world, feeding the hungry, granting last wishes, and giving out more than one surprise, even going so far as to accept an invitation to the S.H.I.E.L.D. graduation dance from Cadet Roz Solomon. Many, many centuries later, future Thor journeys once again to Midgard because Thor always returns to Midgard. Jason Aaron continues to use the three different versions of Thor, which initially seemed nothing more than a plot device for the last arc, but makes it a key storytelling element now. The touching moment with Jane Foster was nice, as is the introduction of Roz into the story, with whatever implications that carries. While regular artist Esad Ribic is taking a break, Nic Klein is no slouch. 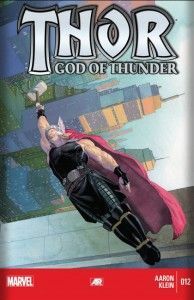 While he doesn’t have the same style as Ribic, Klein still has a style and tone that lends well to the completely vast and nearly all-encompassing world that Thor lives in. He journeys from Oklahoma to the Moon to an entire other dimension, and each of these places has to be depicted in a way that seems consistent, and Klein nails it. This issue, like few others that start a new arc, doesn’t really say anything of the last arc. Thor just goes straight to being Thor. The story told is one that sheds a softer light on the Thor of the present Marvel universe, which is something that fans certainly need to see. New readers can definitely jump in and be engrossed in this world that Aaron has constructed. Parental Concern: Minimal. Mild language and whale skeletons. With the success of Hellboy, both in comics and on the big screen, it only makes sense to try to get the characters to a new audience, and in this case it’s children. 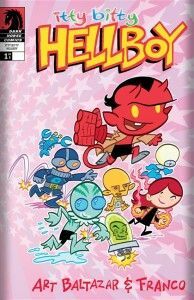 Featuring tiny versions of all the main characters, Hellboy, Liz Sherman, Roger, Abe Sapien, Rasputin, Karl Kroenen have a series of short, related adventures. The first story features Karl and Rasputin as they discuss Hellboy and how Karl’s box fort can withstand any attack. The second story involves finding Roger the homunculus’ underwear, and the next shows how the kids deal with Johann‘s cold. After the addition of another box fort and soup for Johann, the issue ends with everyone getting together to go swimming, even if they do need to change the water afterwards. Art Baltazar and Franco split writing duties, with Art also doing the art. The two have a way with the simple, kid friendly stories that makes them instantly endearing. Baltazar’s art is perfect for the cartoonish stories and lends a decidedly light and bright approach to the often dark and serious world that Hellboy exists in. New readers can enjoy this, no doubt. On its own merits, it’s a solid book with quality art and storytelling. It’s only made better for being a vehicle to bring Hellboy to a wider audience. It could conceivably act as a great transitional work to get younger audiences into the other Hellboy books, but that remains to be seen. If someone has been routinely knocking you out and stealing your organs, it’s a pretty big problem. Unless you’re Deadpool, and then it’s just another day in your life. With the knowledge only that someone named “Butler” is behind the organ snatches, Deadpool sets out to solve the mystery in a way that only he can. First, he makes a trip to Avengers Mansion, dresses up like a butler, and wakes Wolverine up to ask for help. When that doesn’t pan out, he seeks out Captain America for some super soldier advice. Not finding what he needs there, Deadpool retreats to the crime scene that will be his bed for the night. In the night, he’s attacked and successfully fights off the attack with the help of Wolverine, or maybe he’s just imagining it. Brian Posehn and Gerry Duggan have been very hit-or-miss for me on writing Deadpool, but this issue was a good one. 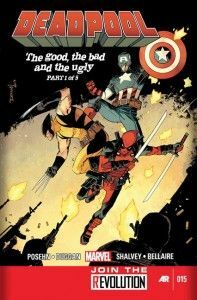 It builds on an existing plot element and keeps the story pretty serious in tone, while still allowing for Deadpool’s odd, dark brand of humor. The art from Declan Shalvey, with Jordie Bellaire on colors, lends a nice look to Deadpool’s insane adventure and the colors make the whole thing pop. New readers might have some problems with the story, especially the whole organ snatching plot line, but it’s still a very solid issue. The recap page can do a good bit on catching up a potential reader, so that might be enough. Parental Concern: Moderate. Violence and the festering wound that is Deadpool’s body. 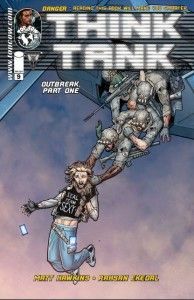 Following government research scientist David Loren, Think Tank is about a man who gets tired of designing things that kill people and wants to escape. After being on the run, David reluctantly returns to work for the government and designs even more deadly weapons. After David sees his girlfriend get kidnapped, he’s now part of a Navy SEAL team expedition into Taiwan looking to recover a weapon that he built and somehow get his girlfriend back. After the helicopter their in crashes, David and a lone SEAL are left to get back to the extraction point, only to have them captured by yet another weapon that David built. Matt Hawkins writes a story that’s full of cutting edge science and witty, cranky protagonists. David is super smart, but he’s also a bit of a smug jerk, but he’s just good enough to make you like him. The art from Rahsan Ekedal renders the world of Think Tank in amazing black and white detail. The attention he gives to the characters and environment adds a layer of depth that even a good colorist couldn’t add. New readers can jump into this fairly easily. David himself explains most of the past events as he thinks to himself of his current situation. The issue as a whole is well put together and a good read. The science aspect is sure to attract a few readers as well. Parental Concern: Mild. Language, violence.